Comments: There is an entry in the GRO indices for Apr/May/Jun 1894 for ther birth of a Dorothy Milner in Wandsworth (volume 1d, page 653). I have a copy of Dorothy's birth certificate now. She was born on the 17th March 1894 at the address her parents were living at at the time - 60 Abbeville Road South, Clapham. Her father's name is entered as George Milner, as we would have expected. Her mother's name is recorded as Emily Milner, formerly Leech. Her father's occupation is Grocer's Assistant. The birth was registered on the 5th April 1894 and the registrar was one George Thatcher. Aged 7 at the time of the 1901 census, her birthplace was recorded as London Clapham. 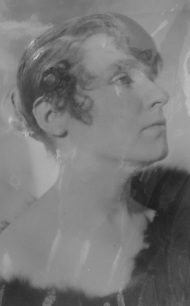 At the time of her marriage to Basil (August 1916) her age was recorded as 22. This suggests she was born in the first quarter of 1894 - consistent with her birth certificate. Dorothy had already passed away by the time of her son Gerald's marriage in 1937. She probably died some time in the 1930s. Apparently the cause was pneumonia. Apparently Dorothy was a talented pianist, and for a time played the organ which accompanied silent movies. The marriage is recorded in the GRO indices for Jul/Aug/Sep 1916 (Portsmouth, volume 2b, page 883). The marriage certificate shows the date to be 5th August 1916. The marriage was witnessed by Dorothy's parents, George and Emily. At this time Basil's address is recorded as 60 King Street, Southsea. A rather glamorous looking picture of Dorothy, possibly taken by Basil.